So… you have a wish. And you want it to come to reality, right?? 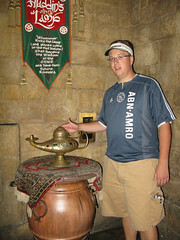 Aladdin also had some wishes, but he materialized them by using some extraordinary power named Genie, remember?? Right. I want you to know that you too have a Genie in your life… wanna guess?? its name starts with U_____, any guesses?? Well, let me make it easier, its the Universe, of course.